Cooking outdoors is always an adventure. Whether you are using a grill at the park, a portable stove, or an open flame, your food always seems to taste better when it has been cooked under the open sky. So decide on the type of trip you want to have, and choose which cooking equipment will work best for you. When you are backpacking, you need to be conscious of the weight and dimensions of everything you carry with you. The three stoves listed below are compact and lightweight – perfect for preparing a hot meal after spending all day on the trail! 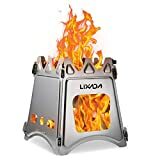 If you plan on hauling all of your camping equipment on your back, but still want to eat hot food instead of trailmix and jerky, then this stove is a fantastic option for you. It consists of a burner base and a small propane bottle, which separate for compact carrying. This stove measures only 7.8” x 7.8” x 3”, and weighs only 3lbs. It fits an 8” pan and the temperature is fully adjustable. You can cook something at low, medium, and high. Amazon users report that one propane tank lasts comfortably for a three day, two-night adventure. This portable stove is teeny-tiny. 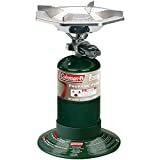 It connects to any 7/16 thread single butane/butane-propane mixed fuel canisters, so you can pick how large your fuel supply is based on how long your trip is. The stove itself is made of aluminum alloy and stainless steel, which makes it light at only 4.8ozs. It collapses down to only 3.5” x 1.8” x 2.3”. It even comes with a carrying case for easy transport. 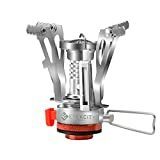 If you are planning a rigorous backpacking trip but do not want to sacrifice a hot meal, this is a great, low commitment way to bring a stove along with you! If you want to bring a stove but do not want to haul around a fuel canister, this stove is a great option for you. This stove heats by burning branches and leaves, so all you have to do is collect some fuel before you prepare your dinner. It weighs only 1.2lbs and collapses down to 5.5” x 5.5” x 3.8”. This stove comes with a storage bag. It is very sturdy and heats quickly, making it a great way to prepare a large outdoor meal when super hungry. This is another wood burning stove that is roughly the size of a water bottle. It weighs only 13.6oz, so it is lightweight and easy to transport. With a large opening for branches and twigs, you can keep the stove burning for as long as you can find fuel to place under the pot or pan you are cooking with. When you are done cooking, you can take the stove apart and store it in a compact drawstring pouch for easy transport. 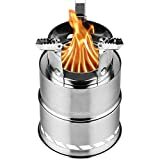 This is a great stove to bring with you if you want a hot meal but do not want to carry a fuel canister around with you. When you are camping at a campsite, you have some more freedom when it comes equipment size and weight. The following stoves are more robust, offering the freedom to cook larger meals or two dishes at once. This tabletop stove fits an 8oz butane canister and operates a lot like your stove at home. It weighs 3.1lbs and measures 13.5” x 4.4” x 11.2”. It is portable, but not ideal for long hikes. One 8oz canister lasts 2-8 hours, depending on the heat setting. You can easily prepare a few days worth of meals with just one canister. 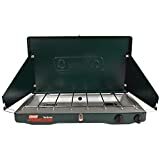 If you are spending a weekend away at a drive-up campsite, this is a great piece of equipment to have with you for outdoor cooking. This is another tabletop stove, but it comes with two burners instead of one. It is large enough to fit a 12-inch and a 10-inch pan, side by side. The two burners are independently controlled, so you can simultaneously cook two things at two different temperatures. It comes with a shield that protects your burners from wind and measures 4.1” x 21.9” x 13.7”. It weighs 11.8lbs, so you definitely don’t want to have a long hike with this stove. But for a drive-up camping site, it is a great tool to have with you to help you prepare hot meals. This stove is the largest on the list, which makes it great for extended trips. It is not a tabletop stove. Instead, it comes on its own stand, measuring 34” x 9.5” x 16.25”. It has two independently heated aluminum burners and connects to a propane tank for an extended fuel supply. This camp stove combines the benefits of your home kitchen with the thrill of cooking outdoors. The legs are removable for transport, and the whole stove fits into a convenient carrying case. This portable stove is the Cadillac of outdoor cooking equipment. It is not only a two-burner stove but an oven as well! It is heated with propane and reaches maximum temperatures of 400 degrees Fahrenheit. The two burners are heated independently and come with a wind guard. The entire piece can fit conveniently on a picnic table, so you can have all of the convenience of cooking with a stove and an oven, without sacrificing your campsite floor space. This is a great option for family trips or extended stays. Remember that when you are cooking outdoors, you need a lot of specialty equipment. In addition to the camp stove, you will need outdoor cookware, fuel, dishes and cutlery, and a way to dispose of trash. So gather your supplies, and enjoy your outdoor cooking experience!